The Cultural Nature of Human Development 0 Edition Three-year-old Kwara'ae children in Oceania act as caregivers of their younger siblings, but in the UK, it is an offense to leave a child under age 14 ears without adult supervision. In the Efe community in Zaire, infants routinely use machetes with safety and some skill, although U.S. middle-class adults often do not trust young children with knives. What explains these marked differences in the capabilities of these children?Until recently, traditional understandings of human development held that a child's development is universal and that children have characteristics and skills that develop independently of cultural processes. 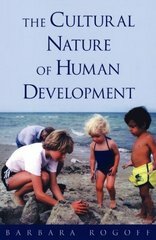 Barbara Rogoff argues, however, that human development must be understood as a cultural process, not simply a biological or psychological one. Individuals develop as members of a community, and their development can only be fully understood by examining the practices and circumstances of their communities.